If you’re a caretaker for a dog and the planet, you’re probably interested in learning the best way to dispose of dog waste. You can either compost, flush, or trash your dog poo. 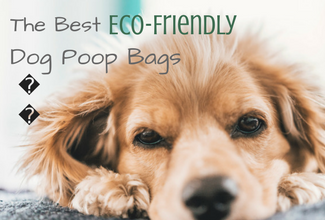 In this post, I’ll identify green methods for cleaning up after your dog and recommend the best eco-friendly dog poop bags that you should look for. It’s important to take some time to understand the best way to dispose of dog waste because it can have a drastic impact on how much waste we produce. Conservatively, a dog poops twice per day. 2 bags per day multiplied by 365 days per year implies 700+ little plastic baggies of poo going straight to the landfills, per dog. Since traditional plastic does not decompose in landfills, any minor improvement we can make to this situation, whether thru a more eco-friendly dog poop bag or avoiding dog waste bags completely, will have an immensely positive impact. My doggie poop bags are the “green” ones – the ones that are advertised as “Earth-friendly”. Labels like these make me feel better, but should they? I started wondering what it really means when a dog waste bag is labeled “biodegradable”. Is there a benefit to biodegradable bags if I don’t intend to compost that bag? The best way to dispose of dog waste is to compost your dog’s poop, but for many individuals, especially those living in cities and small spaces, this is not realistic. Thus, in this article, I’ll be discussing the various green ways to clean up after your dog. A standard dog waste bag is what you purchase when you don’t give dog poop bags a second thought. They are made of plastic and are the lowest priced option. These bags look like standard plastic dog waste bags, but they are often green in color to emphasize the claim of being “Earth-friendly”, or they label themselves as biodegradable. As people are becoming more eco-friendly, these bags are now coming out more in fun colors, statements, or designs. There are options made of different materials, but here is a list of the two most popular types. An oxo biodegradable bag is made of traditional plastics with specific additives (i.e. cobalt, manganese, iron, etc.) incorporated that act as the chemical catalysts to start the fragmentation process of the plastics. This fragmentation starts when there is exposure to UV irradiation or heat and will break down the plastic to sizes invisible to the naked eye. Next, these invisible fragments are theoretically meant to biodegrade, but there are mounting claims against this. Some studies even claim that oxo biodegradation is more harmful to the environment than your standard plastic dog waste bag because if the bags indeed do not completely biodegrade, the incorporated metals (additives) may leach into its surroundings. In addition, if the bags fragment but do not biodegrade, there are uncertainties about the impact of these plastic fragments on the environment (i.e. consumed by wildlife, entering the water streams, etc.). Note that oxo biodegradable bags cannot be composted and should not be recycled. Some additional interesting articles here and here. There are many companies out there that aren’t being fully honest, in my opinion. They label their products as “biodegradable”, even when it is only “oxo-biodegradable” hoping that the consumers won’t know the difference. This is an example. The FTC has been trying to crack down and better enforce what is labeled as “biodegradable”, but it’s not completely there yet. A biodegradable bag is generally made from corn starch whereby the starch is converted into a polymer to be molded in the same way as conventional plastic (which is made from petroleum). ASTM D6400 is a test for compostability. Certified products are confirmed to break down into CO2, water, inorganic compounds, and biomass when composted in municipal and industrial aerobic composting facilities. When this happens, there is no visible, distinguishable, or toxic residue. If you are disposing of your biodegradable bag in the normal garbage stream, however, it will most likely go to a landfill and stay in the landfill for a very long time, not degrading like intended. Biodegradable materials need sunlight and oxygen to complete the biodegradation process. If the bag arrives at a landfill and cannot decompose before it’s covered by another layer of trash, it will most likely not get enough of the sunlight and oxygen that it needs to finish biodegrading. Opponents of biodegradable bags point out that in landfills, biodegradable materials will emit methane when decomposing, which is a stronger greenhouse gas than CO2. If you pick up your dog poop using a biodegradable bag, the best option is to compost it. However, an important note to mention is that since dog poop may contain pathogens, it should NOT go into a backyard or community compost if the end-product compost is intended for use to grow food items. Compost from dog poop should only be used for flower beds and other non-edible plants. Some guidelines from the USDA here. If you’re thinking of purchasing these, here are some options so there’s no confusion between oxo biodegradable vs. biodegradable: Option #1 | Option #2. In general, instead of searching for “biodegradable dog poop bags”, try searching for “biodegradable dog poop bags ASTM D6400“. A flushable dog poop bag is generally made of PVA, a water-soluble synthetic polymer. Theoretically, a flushable bag of dog waste seems like a great solution. We already have this entire waste processing system in place for human excrement. It would be so great to be able to dispose of and process dog poop in the same manner. If you’re interested in this solution, you have to verify beforehand that your waste processing facilities accept dog waste. If yours doesn’t and you flush dog waste down anyways, it’s out of your sight, but means that any pathogens/diseases in the dog waste will not be caught by the facility and will leak into our waters. Another worry is that while PVA breaks down near perfectly in hot water, toilet water is at room temperature and will often slow down the decomposing process. My apartment’s plumbing is quite old and adjusted to be low-flow. If there is one thing I hate the most about home maintenance, it’s dealing with a finicky toilet. Personally, I don’t want to take the chance of messing up my plumbing system. I’m currently designing a paper dog poop bag so we can finally have an Earth-friendly solution to convenient dog poop disposal. If you’re interested in being one of the first ones to test our these paper dog poop bags, please leave me your email address in the below sign-up form. Note: This form is specific ONLY to the paper dog poop bag development. If you would like to subscribe to the overall blog newsletter, you can do so here. The argument of paper vs. plastic is well-documented from the debates on grocery bags. While most people believe paper is superior than plastic, it should be noted that in terms of the production process (raw materials, energy & water usage), plastic has less of an initial environmental impact. Considering also that any dog waste bag will most likely end up in a landfill, opponents of paper dog waste bags argue that paper takes up more volume than plastic – filling up landfills more quickly. However, whenever I can, I do ty to use the paper dog poop bags. Amsterdam has a waste-to-energy plant that incinerates non-recyclables into energy. I would much rather have them burn paper over plastic. I would rather source paper (from natural trees) than plastic (from finite oil reserves). Sandwich bags: Do you pack your lunch or snacks in a sandwich bag? Pack the bag back up after you eat and use that to pick up your dog’s poo the next day. Even if it’s a bit dirty on the inside (mustard leakage? ), you simply turn it inside out right before you’re about to use it so keep your hands free and the poo dirty. Inevitably, other plastics may end up in our homes whether as snack packs, produce bags, newspaper bags, or any other non-recyclable packaging. If something is intended for the landfills anyways, you can use these as a simply way to pick up poo and quickly dispose of it. They won’t be getting a third and fourth life, but at least they’ll get a second life. It doesn’t have to be plastic-like! Some people layer up old newspaper / junk mail to pick it up the poo. If you live in the city / residential area, do not leave dog poo unattended to thinking that nature will attend to it. In the natural world, it’s true that nature should attend to it and break it down itself, but nothing is natural about the amount of dogs that we have in the world right now due to human domestication. There are simply too many dogs, generally living in too much of a condensed space, to think that nature will properly attend to poo the poo properly without spreading diseases. Do not flick the dog poo under some bushes or “off-trail”. Just because you don’t go into the bushes or “off-trail” does not mean that other people and other animals do not. If there are one-use non-recyclable plastics in my home that are going into the trash can anyways, I will try to use them first. If none are available (the ideal) and the situation permits, use a few layers of old newspaper. On-the-go, my preference would be to use a paper dog waste bag because even though paper uses more resources to produce than plastics, it is more biodegradable. Secondly, I would choose the biodegradable (certified ASTM D6400, or comparable level of certification) bags. One might question why I would choose to pay more for biodegradability and risk the release of a more powerful greenhouse gas (methane), and that would be a fair question. The reason I would choose bioplastics is because while I don’t think we have a perfect answer right now, I have faith that we will figure out a solution in the future. New landfills are being constructed with a focus on enabling & promoting biodegradation – viewing landfills as a “treatment center” instead of a long-term waste containment structure. We aren’t there yet completely, but the future is bright in my view. If proper biodegradable dog poop bags are not with my budget or unavailable in my area, I would choose a standard plastic dog waste bag OVER an oxo-biodegradable dog poop bag. As mentioned before, oxo-biodegradable bags are made of the same plastic materials as a standard plastic bag. The only difference is the added transition metals that will make the bag fragment over time. There is currently no research (that I’m aware of) that indicates these fragments will assimilate naturally in the environment. My interpretation of this is that these plastic fragments may be consumed by wildlife, which is something that I want to avoid. If the same volume of plastic is going to be present whether I choose a regular dog poop bag versus an oxo-biodegradable poop bag, I would rather the plastic stay whole and easier to see. It’s much more of an eye-sore from a litter point-of-view, but at least you can pick up the litter instead of just thinking there is no litter just because it’s disintegrated and you don’t see it. Lastly, I have flushable dog poop bags. They are not necessarily harmful for the environment, but unless you’ve confirmed with you municipal water department and are comfortable that your plumbing and water-levels are sufficient to not cause a blockage, they are not my first preferences. Which bags do you use now? Which bags will you use in the future? PreviousPrevious post: The Best Kind of Christmas Tree Is . . . ?